I often said to Tony he was my political father, and he was. He thought this was really funny. But he really inspired young activists like me to take up the causes of the voiceless people in our communities who were being starved, pauperised, racially-abused or dumped on the scrapheap at 16. And from there, I got involved in asking why the US and UK got involved so often in militarily and economically occupying foreign lands, and in overthrowing democratically-elected government’s in countries simply because they wouldn’t do what they were told. 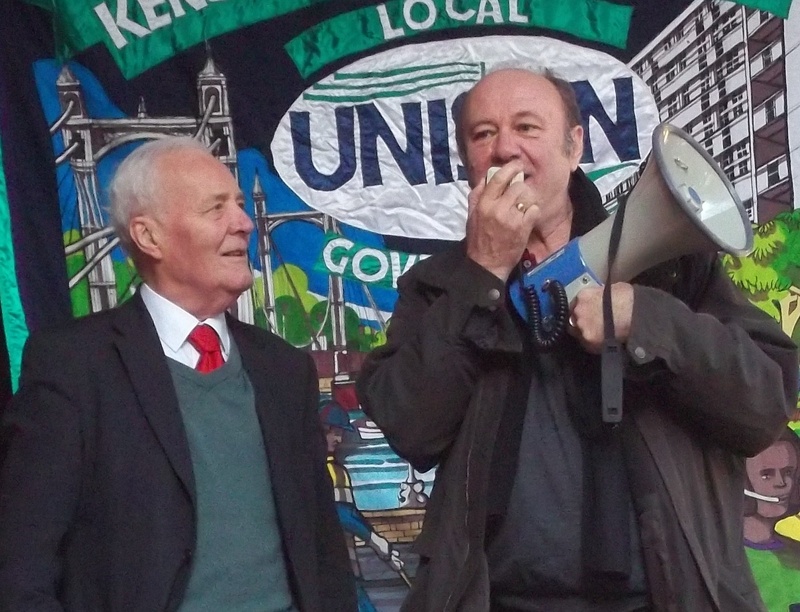 I first met Tony when he spoke at public meetings in North Kensington supporting the 1984-85 Miners Strike, and on the many National Union of Mineworkers London demonstrations and Rallies where he gave fiery speeches. I asked him to come to the protest outside St CharlesHospital in 1991 to stop Mrs Thatcher’s regime from closing the Accident & Emergency department. He addressed the large crowd on a megaphone. Tony supported the Borough Anti Poll Tax campaign that regularly picketed West London Magistrate Court when people were prosecuted for not paying. 15 million in the UK refused or couldn’t afford to pay, causing Mrs Thatcher to be booted out of office by her own Party in 1990. I asked Tony (a former Labour Government Postmaster General) to join the campaign against the closure of Westbourne Grove Sorting Office in 2004, and he did. I marched with Tony on many demonstrations and spoke at meetings with him to support Freedom for Palestine, so I asked him to be president of K&C Friends of Palestine, and he said yes. He was utterly enraged when the BBC refused to broadcast the Disaster Emergency Committee’s Appeal for Gaza in 2008 when Israeli bombing killed 1400 civilians there because they said it would be too political. 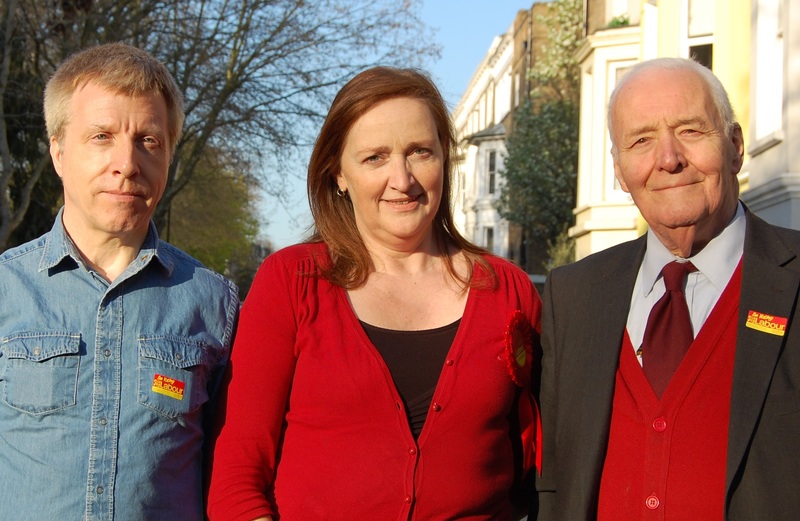 He supported the campaign against the Council’s closure of the Edenham Old People’s Home in Golborne Ward in 2009, and gate-crashed Edenham with an ITN camera crew with Pat and Emma when the Council refused us entry. He also supported “1958 Remembered”, the Borough-wide project in 2008/9 to remember the Notting Hill race riots, the racist murder of Kelso Cochrane in Golborne in 1959, and to celebrate the subsequent 50 years of good community relations. He did a packed-out “Evening with Tony Benn” at Inn on the Green under the Westway. Tony was a great man who inspired me to believe that you could change the lives of the poor and most vulnerable people in our communities and internationally if you were prepared to give them a voice and fight for change against a heartless, greedy and violent capitalist minority. He was my political father and I intend to continue to follow his example. Golborne Councillors asked Tony to attend a meeting at Edenham Residential Care Home in 2007, as the Council planned to move out residents and demolish it (which they succeeded in doing). We had an ITN crew coming in with cameras at noon and invited him to attend and speak for a piece on the news. Tony arrived an hour early to speak to the residents, taking his time with everyone, even those with dementia, and their families. 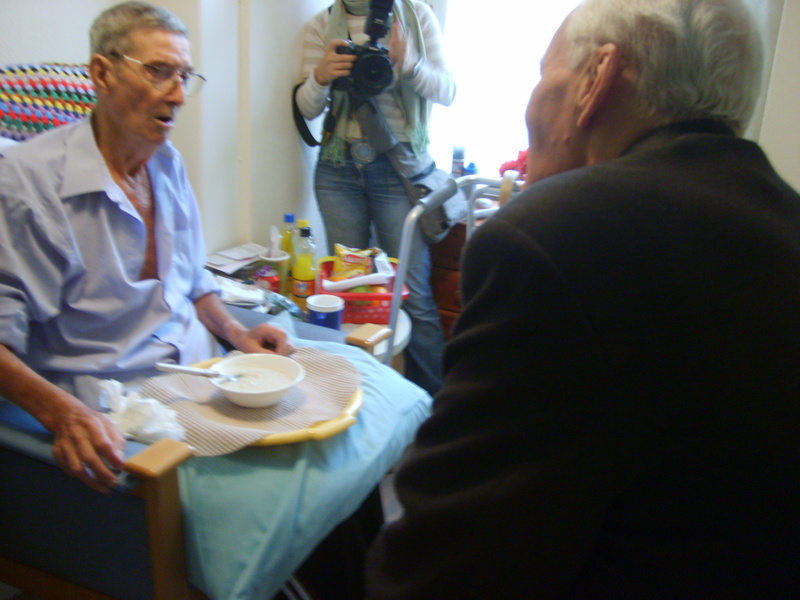 Here he is speaking to the residents’ spokesperson, Reuben Halsey. Everyone was very touched by his visit. A Council officer appeared and demanded we leave the premises – but we had been invited by residents and it was not for an officer to demand we leave. Tony thanked the officer firmly for his instruction, saying “You can tell your superiors you have given the instruction, which we intend to disobey”. It was a fine moment for democracy and free speech. I had the pleasure of meeting Tony when I was at school taking my A levels in the 70s. He inspired me and gave me the determination to study politics at uni. I subsequently met him at conventions and talks. He was one of the best post-war politicians, and gave courage to his convictions. He was honest, brave and dedicated to the common purpose and goodwill of all. If we are able to prove our mettle like Tony, and rise above the duplicity and muck-raking we are witnessing, then our homage to him will be applauded. 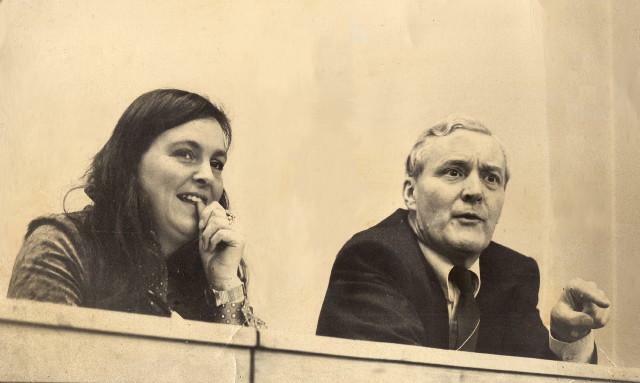 I first met Tony when I was assigned by The Times to cover his support for Labour candidates in marginal wards in the second 1974 General Election. He was at first very suspicious, but gradually came to trust me as a journalist and we became friends. He always took credit for introducing me to Tom Litterick, one of the successful candidates in that election, who became my partner. He was also very supportive during the year long lock out of the Times and Sunday Times in 1978 and later supported my campaign in Cremorne in 2006. He was an inspiration to me and many others and will be sorely missed. 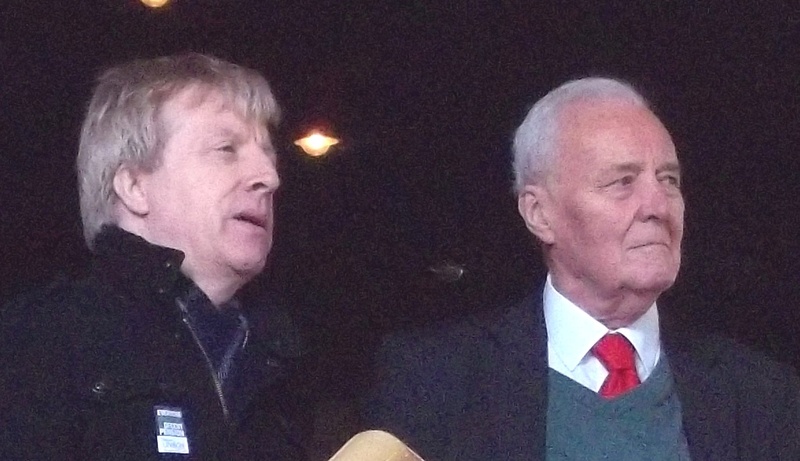 I remember talking to Tony at a time when Labour members, particularly those who had been part of the struggle to return a Labour Government were then questioning the direction of the party. I was seriously thinking of leaving the party but Tony said while they allow you to be a member, you must be a member. So it is thanks to Tony that I am still a card carrying member! 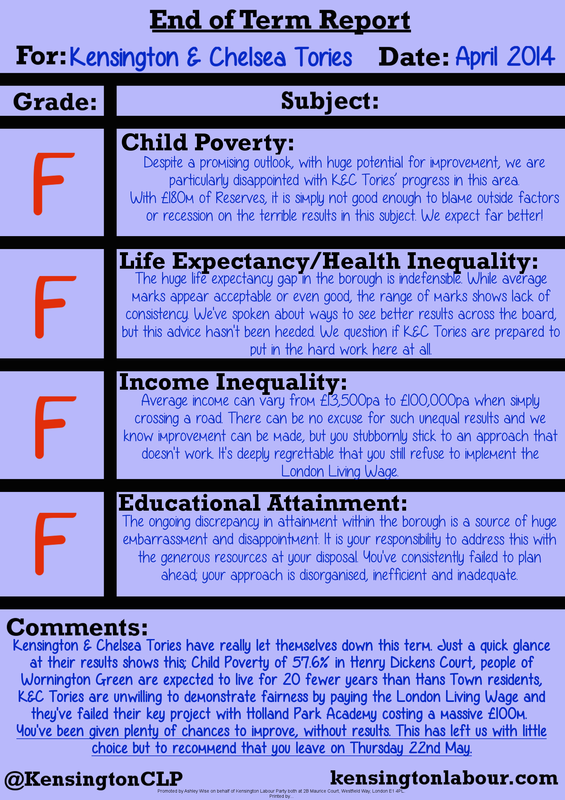 The ten posts highlighting different areas of inequality in K&C were posted one per day in the run-up to the Council Budget-setting meeting on 5 March 2014. The borough known as ‘The Royal Bank of Kensington and Chelsea’ has £180m in Reserves – and some of the poorest residents in London. The statements are based on evidence, not dogma or the Daily Mail. Links to sources can be found below. While some people are prone to diabetes, it is associated with poor nutrition. 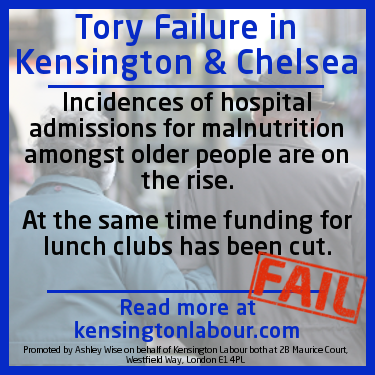 Lunch clubs in the borough have been closed, and others are having funding reduced, while malnutrition among older people admitted to hospital is on the rise. RBKC is blessed with parks and green space, tennis courts and other sporting facilities. However, over the years these have been ‘monetised’, with former kickabout spaces developed or transformed to ‘booking only’. 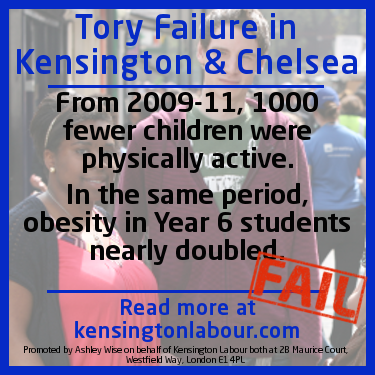 Funding for primary school sports activities has been decimated, and free swimming for children (and over 60s) stopped. Number of homeless children 0-18 in B&B/temporary accommodation estimated to be 1,800; two-thirds are housed out of the borough, far from school and other sporting activities. Two-thirds of the adult population in K&C are in employment, most in full-time employment. While 35% work more than 49hrs/week – second only to the City of London – nearly 5,500 are seeking work. 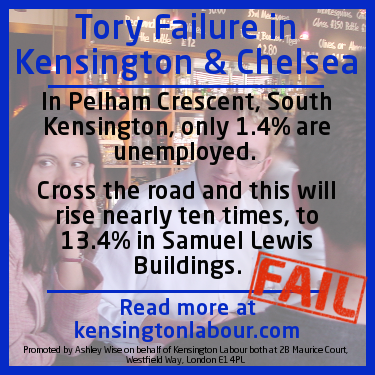 In Pelham Crescent South Ken only 1.4% are unemployed. Cross the road and this will rise nearly ten times, to 13.4% in Samuel Lewis Buildings. Two-thirds of benefit recipients are retired, disabled, or actively seeking work. 915 aged 16-24 are unemployed, 1050 aged 50-74 are unemployed, 908 have never worked, and 2,298 are long-term unemployed; a vast majority of these are in the poorer wards. ‘Eyelash extension and tanning classes for the girls, watching paint pots for the boys: the sad tale of ‘raising aspirations’ through apprenticeships in Kensington and Chelsea.’ At least they will be able to ‘tan’ the Made in Chelsea cast.